I was looking for something green in the yard on New Year’s Day, and I found this. The original tag was laying around, and read: German Chamomile. This is one of many babies of the parent plant, as it is a good low ground cover and spreader. I have yet to harvest any of the flowers for tea. It seems that the window of opportunity for any plant is so short, and I get so busy in the summer just keeping my gardens alive… I have been moving small amount of this around the garden to see what larger plant it might look nice underneath. Right now it is starting to spread around stepping stones. Categories: Uncategorized | Tags: chamomile, flowers, greenery, groundcover, herb, perennial, plant, spreading, tea, white | Permalink. This is one of thefirst plants I bought for here at least 25 years ago. It grew and multiplied for many years, as it did not get pruned at all. Then one year we had a severe freeze and most of the plant died. A number of small starts remained. This is when I started cutting back the plant after it flowered, and noticed how it grew. It is a very drought tolerant herb that likes the sun. 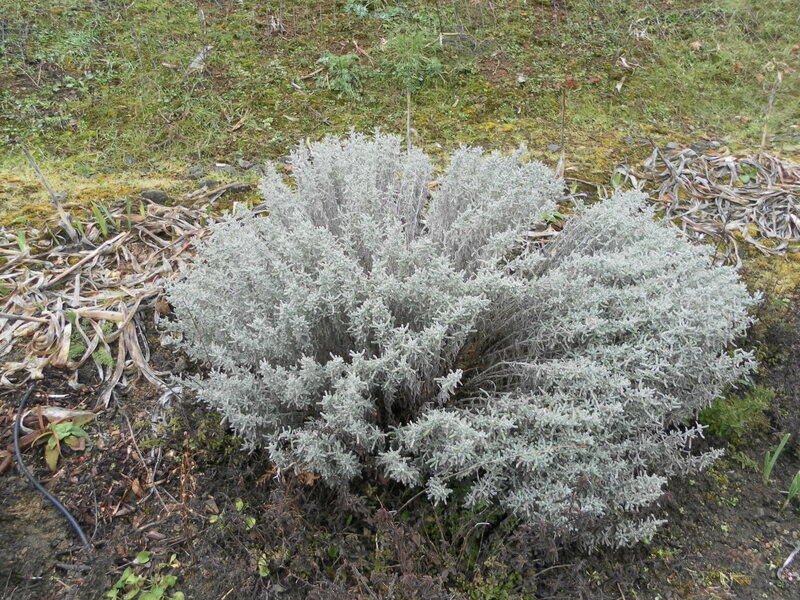 The soft greyish color looks good in flower bed all year long. By pruning, I can keep its growth under control. I’ve read that plants with scented or greyish leaves are generally deer proof, and this has been shown to be true in my unfenced areas. It is slowly getting moved around to other places around the property, as I am now striving for some artistic arrangement of plantings. I had hoped my first post would show a flower, but not this winter. Last year, on New Year’s Day 2013, I had a yellow miniature rose bloom. But we soon got a cold snap, and the flower froze on the bush. Categories: Uncategorized | Tags: aromatic, deer-proof, deer-resistant, flowering, grey leaves, herb, perennial, spreading | Permalink.